A facial mask is a mask full of cream or a special type of paper containing skin nutrients that is applied onto the face. Its main purpose is to provide the nourishment your skin needs from the outside. When a facial mask is put on for a specific time, it does not allow your skin to breath the mask’s nutrients are adsorbed by your skin. 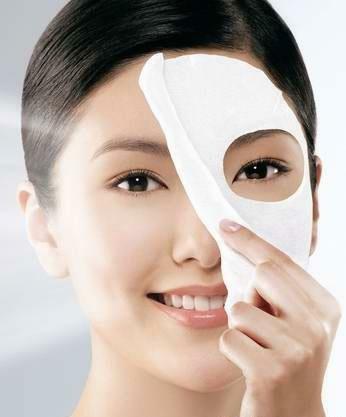 The other functions of the facial mask is to clean and smoothness the face. A facial mask usually contains minerals, vitamins and fruits extracts, such as cactus and cucumber. Okinawa Water Mask contains sodium hyaluronate. A gel type moisture pack rich in deep sea water derived from the beautiful sea surrounding Okinawa (a Southern Island In Japan). It is rich in hyaluronic acid, seaweed extracts and minerals to hydrate the skin. It improves elasticity of the skin and protects the skin from dryness. it effectively tones and provides optimal hydration for the skin that has been severely affected by UV rays in summer or doing outdoor sports. Apply a thin layer of water mask onto thoroughly cleansed face (including eyes and lip area). Ideally, you may leave it on through the entire night. Alternatively, leave it on for 20 or 30 minutes. wipe of with a wet towel and pat it dry lightly. Recommend to use it daily or 3 times a week.